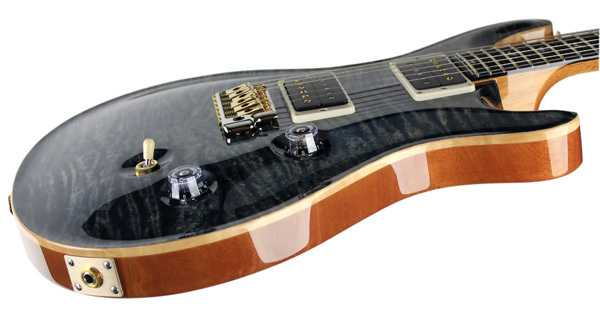 We’re very excited to announce the launch of another ‘exclusive to Europe & Australia’ PRS model – the fantastic Fatback 24, from the Wood Library programme. Based on the 30th Anniversary Custom 24, the new guitar features a thicker ‘McCarty depth’ body, some amazing hand-selected, up-graded timbers – and just 60 of the Fatback 24s will ever be made available. Although the body is thicker than a regular Custom 24, the use of lightweight Ribbon Stripe African Mahogany ensures the guitar balances perfectly – and the wide curl flame maple ‘10-top’ makes the Fatback 24 look as good as it feels, of course. The guitar also features 30th Anniversary mother-of-pearl birds inlays, very cool ivoroid fingerboard purfling and a choice of six colours: Charcoal Burst, Dark Cherry Sunburst, Fire Red Burst, Faded Whale Blue, Black Gold and Orange Tiger. The Fatback 24 carries a recommended retail price of £3750 / €5400 inc VAT – and remember, there will only ever be 60 of these beauties available! 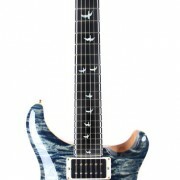 http://www.prsguitarseurope.com/wp-content/uploads/2015/09/PRS_Fatback_24_FadedWhaleBlue_2_web.jpg 900 344 Kieran Morgan http://www.prsguitarseurope.com/wp-content/uploads/2014/06/340-300x137.jpg Kieran Morgan2015-09-09 15:13:342015-10-08 10:58:39New Fatback 24!